At Chicago Academic, we strongly believe that tutoring at the elementary school level requires a strong education background, specializing in early education. However, beginning with the middle school grades, tutoring is as much about mastering a subject as it is learning. For the younger students, tutors must teach the students to develop their learning skills, while in the later grades, they teach the specific material at hand. Tutors spend a great deal of time with your children therefore it is vital to not only teach the academic skills but also skills to better understand their own learning habits. Interview the tutor, be sure he/she is someone of your values and expectations, ask about their experinces, credentials, and references. Does this tutor have experince teaching the grade level where your child is in? It is important that the tutor has expertise in the subject being taught and a proven talent for teaching. 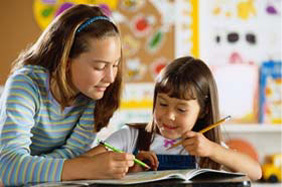 If the tutor is working with a child with a learning disability, it is essential that they have been trained to use appropriate techniques that can address the student's special needs. Personality is as important as credentials in choosing a tutor. When interviewing a candidate of a service make sure to illustrate the type of personality you feel would best suit your student. It is one of a principal conversations when enrolling new families. Students must connect on a personal level with their students for any learning to be achieved. Don't just assume everything is going great after you hire a tutor. Be observant of your childs progress, the tutor is to guide your child with direct teaching. Before teaching sessions start, it is important to go over witht he tutor their teaching strategy for improvement of your childs academics. After each session discuss any ideantified challenges and successes. You want wants best for your child and at Chicago Academic we want that too.